I must make a confession. When I see the words, "goat cheese" in a recipe, I almost always make it. Goat cheese has a delicious flavor and it seems to improve every dish,it is incorporated in. It certainly worked well with this frittata. Originally, I was using a dish from a magazine but by the time I finished cooking it, there was no real resemblance to the original. I used spinach instead of asparagus, added in smoked salmon, baked instead of broil, added onion. While this is a frittata which was the original, I can't imagine much else about it that is the same. Hubby and I both ooohed and ahhhed over this. Pour boiling water over spinach and drain. Add oil to large skillet. Add onions and cook for about 5 minutes until translucent. 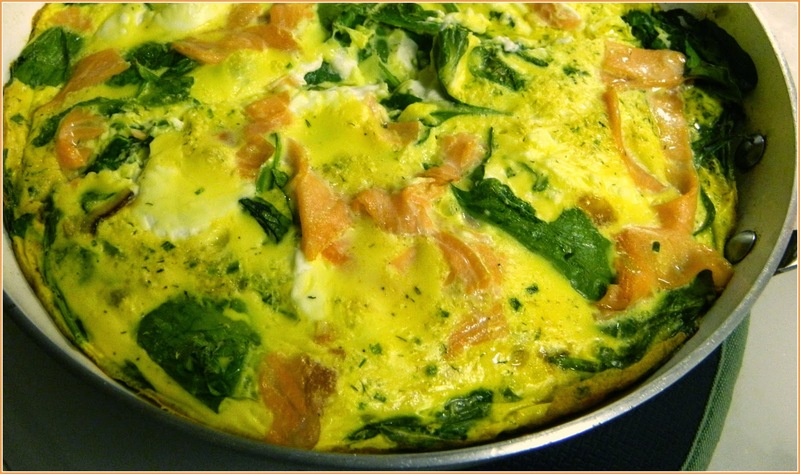 Mix spinach and eggs with dill, chives and black pepper. Pour over onions and let sit until almost set. Press goat cheese and salmon into egg and leave on burner for 2 - 3 minutes on very low flame. Place skillet in oven at 400 degrees. Bake until firmly set about 10 minutes. Remove from oven and loosen egg frittata and then remove onto serving plate. 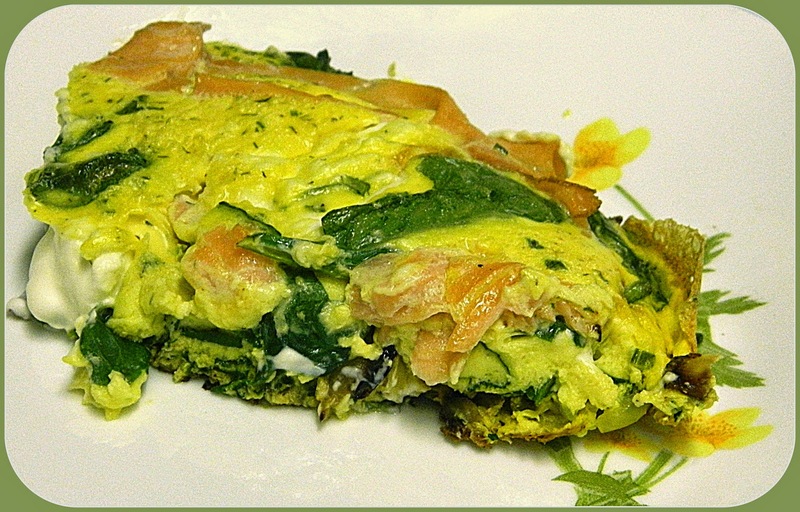 A fantastic frittata! I love how green and delicious it looks! I'm always looking for frittata recipes for our #meatfree meals. This looks perfect. I'm with you! I am drawn to recipes that use goat cheese too. I'm also a big fan of cooking with herbs. Thank you for linking this week. Hope you are doing well! That is a lovely looking frittata, Chaya! You've used some lovely herbs in this recipe! Thank you for sharing with the Hearth and Soul hop. Chinese Barbecue Chicken Soup with Noodles.